Since 1984, Texanlab is one of the oldest independent third party textile testing institutes in Asia. It offers an impressive catalogue of testing facilities for textiles, dyes & auxiliaries, leather & footwears, toys, food and water where tests can be conducted to all major international standards. Texanlab closely works with more than 50 global brands and retailers and has tested more than 350,000 RSL parameters since its inception. With the new lab, the whole team will undoubtedly support the industry to further reduce harmful chemicals and create a greener and cleaner environment. 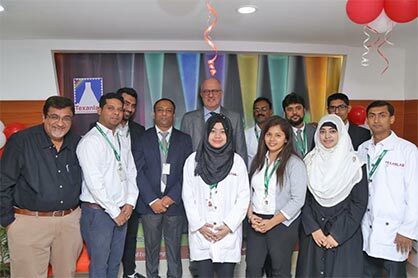 With opening of world-class testing laboratory at Dhaka, Bangladesh, Texanlab brings reliable testing to your doorsteps and bridging the gap of third-party independent testing facilities market. With a proven track record of reliable results, Texanlab is committed to bring fast and cost-effective test results to your doorsteps in shorter lead time. The facilities for testing not only your textile products but also dyes and auxiliaries would be provided to help you ensure eco-compliance for you and your customer’s requirements at your doorsteps in South Asia. Testing facilities for areas like Organic Textiles (as per GOTS standards), ZDHC MRSL Level 1 accepted testing, CPSIA, EU regulations REACH, and Restricted substances list would be covered along with your regular needs of testing on textiles. We have Texanlab in India and Bangladesh. And we would be looking to set up Texanlab in Turkey, Vietnam, maybe in Pakistan. Because these are key countries for the textile industry. Also, we have a further future plan to set up more labs in the region. Eric Hopmann, CEO & Head of Global Sales & Marketing, DyStar Singapore Pte Ltd. In the inauguration program, distinguished figures from the industry as well as the top leaders of DyStar were present. Among them Engr. Md. Shafiqur Rahman, President of ITET; Professor Engr. 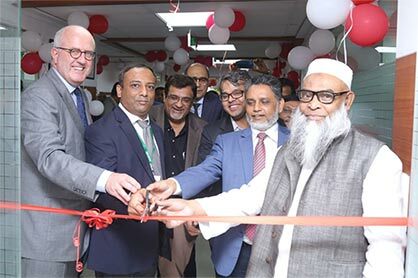 Mashud Ahmed, VC, BUTEX; Eric Hopmann, CEO, Head of Global Sales & Marketing, DyStar Group; Majaharul Islam Sumon, Manager (Bangladesh) DyStar Singapore Pte Ltd; Ridha Najar, Country Manager Bangladesh, DyStar Colours Distribution GmbH, and Jayant Khera, Vice President South Asia, DyStar India Private Ltd & Vinod Kumar, General Manager Texanlab India and Bangladesh were present.